The picture shows RT3496, which is the oldest surviving, and only (genuine) roof-box RT from the country area. 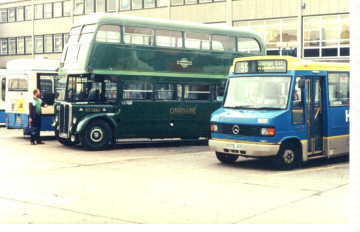 Seen here at Classic Automotion 1997 in company with pre-war RT113 in red London Transport central area livery. Thanks for the lift, Dave and Pam! Click here for the history of RT3496. Designed by AEC before the second war, prototype RT1 embodied many revolutionary concepts - air operated self-changing gears, air brakes, automatic chassis lubrication and a superbly curved and streamlined four-bay body. Only 150 were built before hostilities halted production, easily recognised by their front and rear, roof-mounted route-number boxes. Post-war RTs, from 1947 on, had heavier, jig-built, steel-framed bodies. Until 1948, bodies were built with front roof-boxes (or lighthouses). Parallel orders for Leyland chassis resulted in the RTL variant, which is easily distinguished by its plain radiator. Eighteen green RTL vehicles ran in the northern country area for a year or so from late 1959. There was also the 8 foot wide RTW (also on Leyland chassis) built to give both passengers and conductors more room. These were the first buses in London to the dimensions legal at the time in the rest of Britain (apart from some diverted export trolleybuses of 1943). The last RTs were completed in 1954, by which time there was already a surplus of vehicles and a large number stayed in storage at garages until 1959. 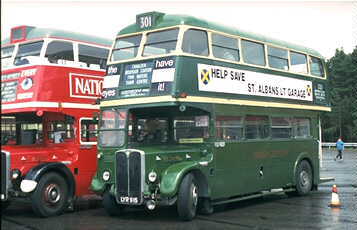 From 1950 the intensively operated Green Line 721 (Brentwood) and 722 (Hornchurch) routes from London Aldgate were operated by new RTs 3229-59 which replaced utility Daimler buses diverted from the provinces to alleviate the desperate vehicle shortage in London. These Green Line RTs were outwardly identical apart from the upper deck bullseye, but had deeper seat cushions and different trim. They were not ousted until the mid 1960's when Routemaster coaches became available. Here is RT 3256 showing the younger generation a thing or two at Stevenage Bus Station in June 1998. In 1970 London Country took over 484 RTs, and two years later 34 prime candidates were sold back to London Transport! The last country RT service ran in 1978, but RT1018 survived as a driver trainer until 1981 - outlasting almost every subsequent LT-designed vehicle - and is now enjoying a well-earned retirement!